The end of April graced us with several spectacular days. 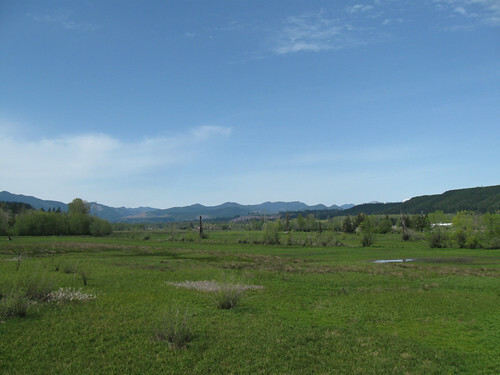 Around noon on the 24th I decided that I was going to go on an overnighter up at Potlatch State Park, which I had been to on my 2011 tour and knew wasn’t too epic of a route. So began a flurry of packing and prepping and by 2:45 I was on the road. A brief stop at a downtown Olympia grocery store and I was on the road. It being mid-afternoon when I hit the road it was pretty much at peak temperature in the low 70s (F). I was riding in as light of clothing as I ever do – seersucker shirt, shorts, sandals – which is so nice. This route is a pretty familiar one for me having ridden parts of it on three different tours and various other parts in my rides around Olympia over the last year. I still had Google Maps generate me a route to see what it would suggest. It had more options off of the highways, which while adding some miles made for some nicer riding. However as seems to be increasingly the case it had some quirks to it. 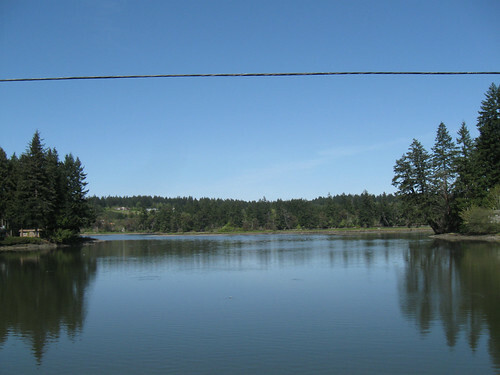 The first of these was just past Mud Bay where it routed me over hwy 101 and toward what was labeled as a dead end road. 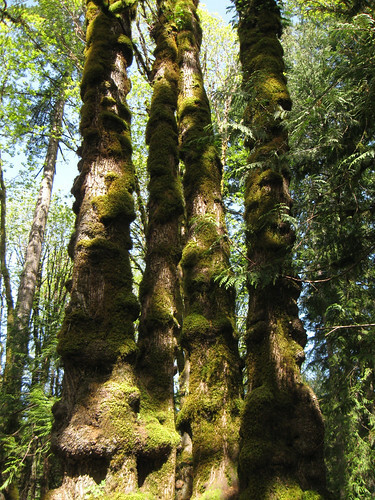 Now it looks like you can get into the Capitol Forest and wander around on logging roads and trails and make it back to 101 a few miles up the road, but not an even remotely reasonable route fully loaded and without a lot of time. So I took 101 on that stretch but did take advantage of Google Maps routing through Shelton. This added a few miles and did put me on some busy county roads but still nice to be off 101. Going through downtown Shelton I noted that it had been rather built up since I’d last been here. There was a brewpub and more coffee houses and touristy sort of places. Nice to see. Google Maps then threw me another monkey wrench. From downtowan Shelton there is a serious climb out from the sea level town back up to 101. I’d ridden up that hill fully loaded (and with serious knee problems) on my 2007 tour) but Google Maps instead put me on a trail up. The trail up Library Hill turned out to be a dirt path with a series of switchbacks. I pushed my bicycle up which might have been about as much effort as riding the road up the hill. At least there was no traffic. Back on the bicycle it was back roads through this part of Shelton and then onto 101. It was magic hour now, with the sun dipping behind the Olympic Mountains. 101 at this point is a two lane highway and really pretty decent riding. Its mostly downhill to Hood Canal and I made good time. I arrived at Potlatch State Park a bit after 7pm to find one other party camping, plus the campground host. Half or more of the campground was closed for the season including the section with the bulk of the hiker/biker sites. There was one in the open loop so I moved in and setup camp. As per usual I cooked as I setup and within 10-15 minutes of completing my setup was eating Green Curry Noodles. Nice thing about an overnighter is you can put together a meal at home, ready for cooking at camp. By the time I’d finished cleaning up, it was dark and a beautiful full moon had risen over the hills. 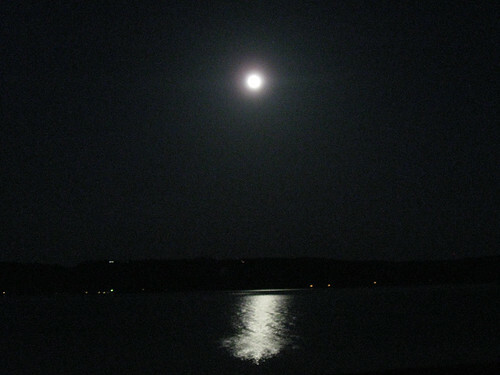 I walked down to the water and enjoyed views of the moon, reflected in the water. It was cooling down, but it was a nice early spring evening. Soon enough I retired to my tent for reading and such before sleep. I rode 41.9 miles on this day. I was in the tent reading when another camping showed up. He came in, parked and then walked around camp looking for his spot before relocating there. With nearly the entire campground empty he chose to move into the one space between myself and the one other group of campers. Odd. I’d only taken this spot as it was the only H/B site; personally I like a little more space between campers when I can take it. Still not so bad as there was a big space between my site and his. I slept all right though it eventually got colder than my gear is really rated for. Even though the day was in the 70s (F) the night still got down to the uppers 30s (F). In the morning I performed my usual tour routing of cooking breakfast as I packed up. Doing a spur of the moment trip like this you are bound to forget something. Well I had forgotten my coffee mug which of course also has my coffee filter in it. So as I had ridden out here I kept stopping at stores and gas stations until I found a place that sold a metal mug. I also grabbed a couple of coffee filters from a gas station and thus was able to make coffee is not as nice as I’m used to. My usual oat bran with dried cranberries and walnuts accompanied said coffee. Not being at all in a rush on this day I leisurely enjoyed my breakfast, reading the news on my iPad (which I also didn’t have to worry about keeping charged). I washed up and finished packing and now I was ready to go. tell me there’s a market town nearby. a girl child carries kindling. From the beach I returned to the campground and then into the woods. 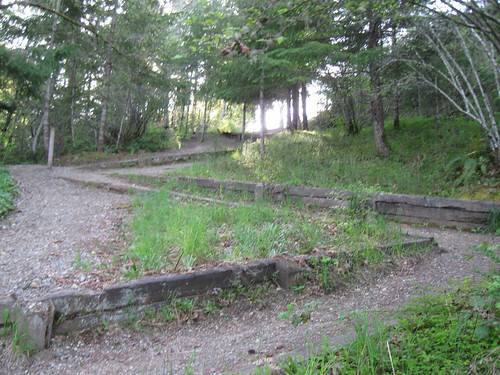 There was a system of trails behind the campground, the entrance just south of my site. I didn’t want to take an epic hike, but I did want to get out into the woods. I’d bought a pair of trail runner shoes and part of the goals of this trip was to see how I’d like them. I felt they worked well in keeping sand and stones out and were fine on the trails. They are supper light and compact well so seem like a good addition to my kit. The woods were pleasantly cool with wildflowers blooming. It was getting toward noon and I wanted to get to Shelton for lunch, so I presently set off. 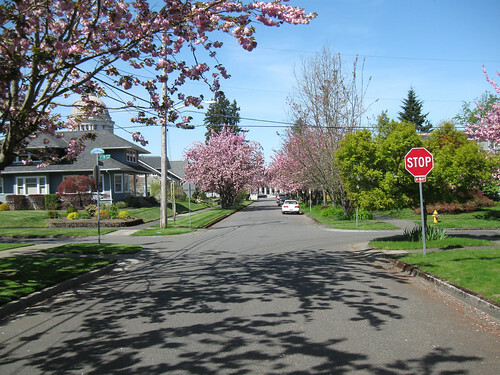 It was a lot more uphill riding to return to Shelton, but this time I didn’t have any time pressures. I stopped frequently checking out trees and streams and waterfalls. There is just an absolutely fantastic section of 101, that climbs for about 2 miles along a stream. Old, moss laden trees surround this babbling brook and traffic aside it is just a pleasant, pretty stretch. From there it opens up and I was able to duck off the highway and take backroads to Shelton — including riding the steep road down Library Hill bypassing the dirt trail. I’d seen the Grove Street brewhouse as I’d ridden through Shelton the day prior and I made a beeline for it. I had very good veggie sandwich accompanied by a Golden IPA which was refreshing and citrusy and a classic porter rather in an Anchor Porter vein. A nice break before hitting the road again. Getting out of Shelton of course meant climbing a big hill on the south side, but it had a decent shoulder and at the top was a scenic overlook where you could see the while town with the mountains behind it and the sound in front of it. From here it was a short ride back to 101. Once again I alternated with frontage roads and riding on the highway. 101 has a big shoulder and a well placed rumble strip so it really is pretty easy, if not super pleasant, riding. I was always happy when I was on the frontage roads which often wended well away from the highway and was in trees, pastureland and crossed several streams. I was definitely feeling the warmth and the several days of riding and was pretty tired when I made it back to Mud Bay. The return trip has more climbing which at least for this trip was preferable – I was in a rush getting to camp but able to take my time returning. It was even hotter today than the day before, but the low 70s (F) is just perfect riding and nothing to complain about. Soon enough though I was back at Mud Bay and the long climb back up to Olympia. I made a detour to a store for some dinner supplies and then made my way home. I was back before 6pm, a bit beyond a rigid S24O but still in the ballpark. Less than 30 hours for the whole trip and a good time was had. 78.3 miles total for this trip. Check out all of my pictures from this trip in this Flickr set: April Overnighter. 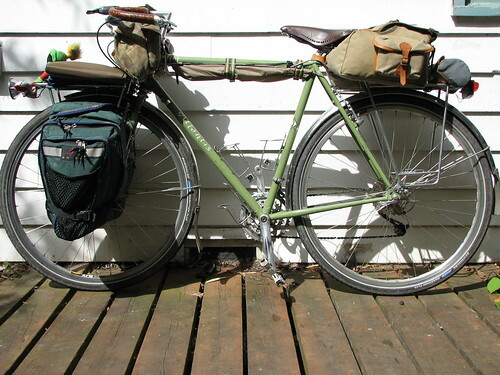 After a rather fitful night’s sleep (my camp was pretty close to the road) I arose to find my rear tire had gone flat. Well preferably to discover this in camp then on the road. On changing it I was unable to find the puncture and discovered that it was the valve. At that point I noticed that one getting the new rear wheel the shop had provided a new tube and it was a Kinda! The very same brand that I had four valve failures in my 2009 West Coast Tour. I changed this, tossing the old tube and was on my way. This was a classic spring day – sunny and windy in the morning and then in the early afternoon a sudden and intense downpour. By the time I had my raingear on it had stopped. This would be the pattern all day and I eventually would just stuff my rain jacket under my pannier covers when it wasn’t raining. My route continued on 106 past the bump in the road that is Union and then I took the Purdy Cutoff to 101. The Cutoff is an excellent side road that is almost always empty of traffic and follows a stream through moss strewn trees. The streams were swollen with snowmelt and spring rain with that fantastic aerated blue/green color that the pictures only sort of capture. The cutoff interests with 101 right before a mile+ long climb along a stream. Not super steep, but it does go on. At the top one pretty shortly comes to Shelton and the 101 becomes less pleasant to ride along – more freeway like with on/off ramps around which one has to be extra cautious. I’d duck off on frontage roads when I could but missed a turnoff that would have spared me a good chunk. So it was mostly highways until I could get onto Mud Bay road. From there it was a long climb up to West Olympia then downhill into downtown and up again toward the capitol where my friend lives and I would spend the next three days. More photos from today or the entire tour can be found on Flickr. “One right to which few intellectuals care to lay claim is the right to wander, the right to vagrancy. And yet vagrancy is emancipation, and life on the road is liberty: one day bravely to throw off the shackles with which modern life and the weakness of our heart encumber us, in a pretence of liberty; to arm oneself with the symbolic staff and bundle and run away”. Today I left my apartment (sorry aPodment) in Seattle where I’ve lived for the last nine months. When I lost my job last July I’d wanted to set out on this tour right then. But for various reasons that was not to be and I did the shorter tour I did last August. I spent the time in between that tour and today’s departure could be consider as preparation for this day: I lived in a tiny apartment with a bare minimum of stuff; making do with less as you do on tour. The winter was very contemplative and inward looking but by early spring I was itching to take off. A May departure was about as early as I felt I could head out (as of today Washington Pass has yet to open). 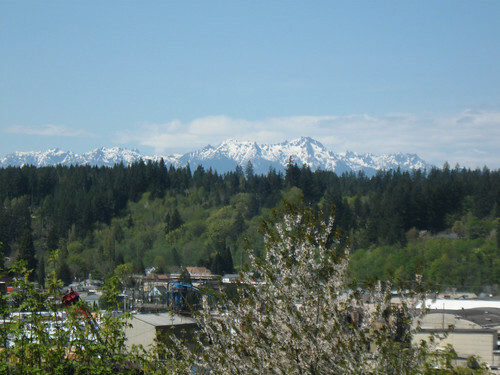 So on this sunny, but chilly mid-spring day, I gave up my apartment and now homeless headed to the Olympic Peninsula. 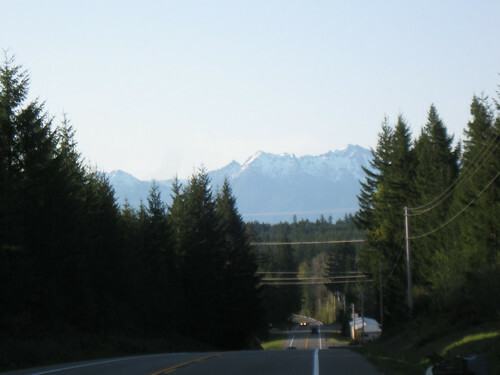 This was a route I’ve done several times – ferry to Bremerton, back roads to Belfair and up along the Hood Canal on the very enjoyable SR106. This was the most loaded I’ve been on this route with the fully loaded Atlantis and I have to say the hill in Bremerton coming up from the ferry wasn’t much of a good time. But after that and negotiating the highways I was on Old Belfair road which is great riding through the woods. 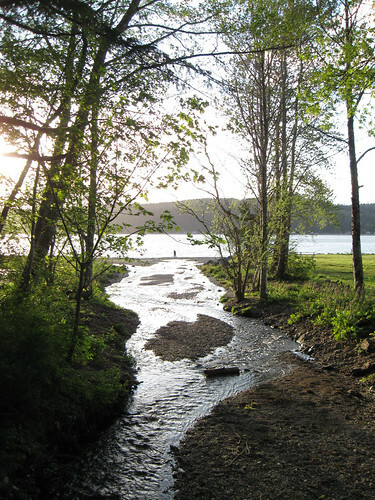 It got even better as I rode past Belfair and turned onto 106 along the Hood Canal. Beautiful riding in the dwindling daylight along the water. Unlike the other times I’ve ridden this route for the first time I camped right on the water at Twanoh State Park. This early in the season the only people at the campground was the host and a couple of RV-ers. 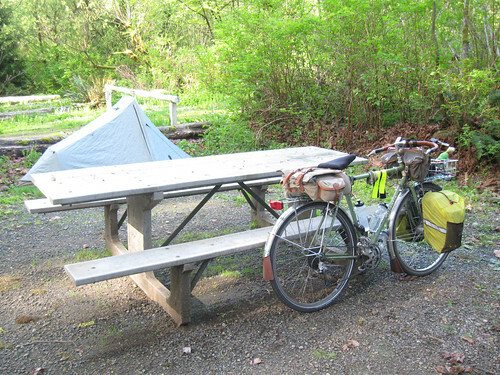 I was the only occupant across the street from the main campground at the hiker/biker/boater site right on the beach. I had a front row seat to the setting sun which painted the streaks of cloud pink and purple as I setup camp and cooked dinner. I was definitely tired from yesterday’s exertions as I end up sleeping until 9am. I was woken up earlier at first light with the pattering of soft rain, but it stopped quickly so I ignored it. 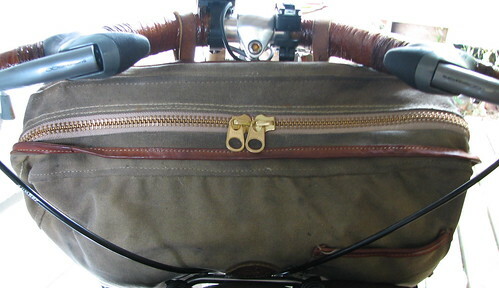 When it came back I got up to cover my saddle which was good as it soon became hard and steady for a spell. It didn’t last though and when I finally did get up it was partly cloudy and warming up. 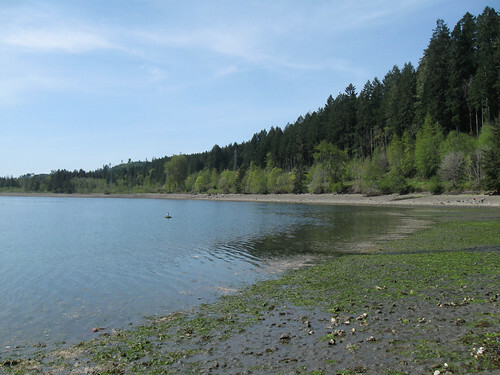 I took my time at Fort Townsend State Park using the showers and seeing what was there. Turned out to mostly be hiking trails (which looked great) so eventually I headed out on the route I’d taken in to Port Townsend last night. A marina is at the end of the trail and while there I swung by the Port Townsend Brewery. It’s just a tasting room and I needed food first so I rode around the marina ’til I found the Marina Cafe where I had lunch before riding back to the brewery for a couple of beers. Brewery’s: the real reason to tour. I give their Hop Diggity IPA a thumbs up. I’d definitely lingered long in PT and it had become hot (this is more August like) so I pretty much rode to the docks and caught the next ferry. It wouldn’t be a WA State tour without a trip on a ferry and this one was particularly nice: clear, with a bit of cloud for interest and warm enough that standing outside was perfect. The route I’m on now I’ve ridden on several tours so not much new to add. It was warm but I hugged the coast most of the time as I rode back roads as usual. Beat from yesterday’s long haul (and the heat and probably mid-day beer) the West Beach Road rollers really wore me down. However the traffic on Hwy 20 had me missing those hills. I stopped briefly in the center island at Deception Pass Bridge to let cars pass and to enjoy the view. 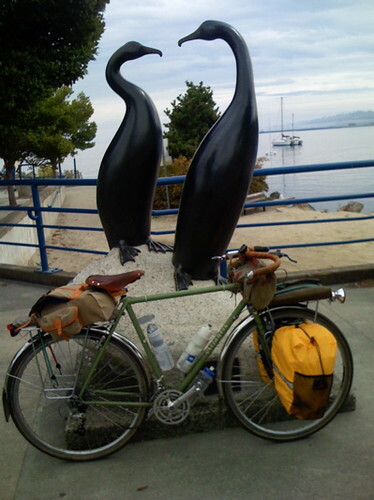 Now on Fidalgo Island I got off the 20 and rode up Rosario Rd, which goes past my childhood house, which turned out to be a horrible mistake – it had been recently graveled and oiled and was hard, slow, unsafe riding. It seemed that all the side roads had been graveled as well so I stayed on the more direct route and the gravel eventually petered out on Havekost Road. It was getting late and I was really tired so just got a room at the Anacortes Inn. 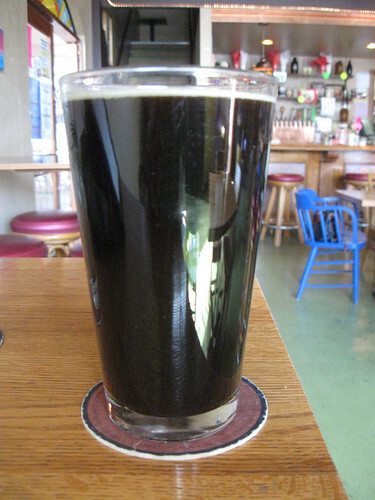 I walked the rather long distance To the Rockfish Grill which is the Anacortes Brewery’s brewpub. Yes two breweries in one day, this is indeed the life. A couple more pints and I was back I’m sorts. I dug their porter by the cask conditioned IPA they had was the big winner. 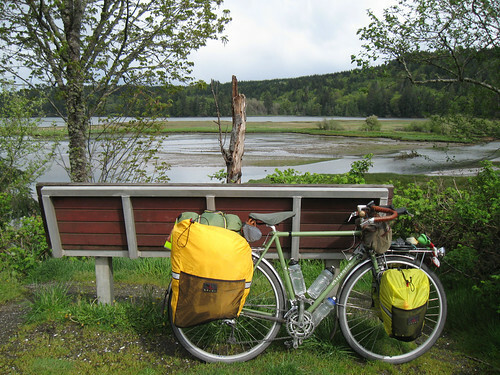 The first half of this days ride was along Hood Canal. The sky was overcast and threatening rain, but it never did. The road hugged the shore and was always going up or down, usually in pretty short segments. The tide was out and people were out in the slob digging oysters. There was that strangely compelling smell of salt air, ocean and decay. 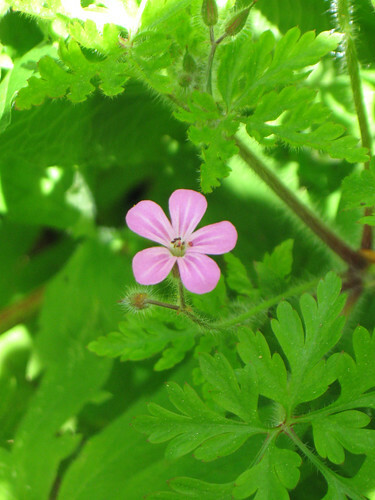 Weeds are just flowers that no-one is minding. Occasionally there were hints of the sun, shining thorough a less dense part of the sky, or even a tiny tear of blue in the dark grey sky. It was fairly comfortable riding though, a bit on the cold side perhaps. Eventually the route turned inward and climbed far above sea level up to Walker Point with it’s view of Mount Walker. This was a pretty, long and wearying climb, several miles in length. At the summit there was a bit of mist, the closest it’d come to raining. The pure green mountains with the must pouring off them was a fantastic sight. The descent was fairly cold but once I got to bottom the rollers returned and I warmed right up. The route turned off 101 onto Center road which was tree lined and nice but not much to see. Here the rolling hills had a lot longer climbs. Eventually it descended into a valley with green pastures and classic farmhouses. At this point the clouds began to break up and there was some welcome sun. I rode up this Valley for several miles, then through a tiny town and on to Highway 20 to Port Townsend. Only a few miles on the highway before the turnoff to Fort Townsend State Park. Up the best down narrow road to the park which had no-one minding the entrance so right on to the hiker/biker site which was a really great site. It was up a little path into the woods which opened up to this space in the woods with cleared spots and picnic tables. 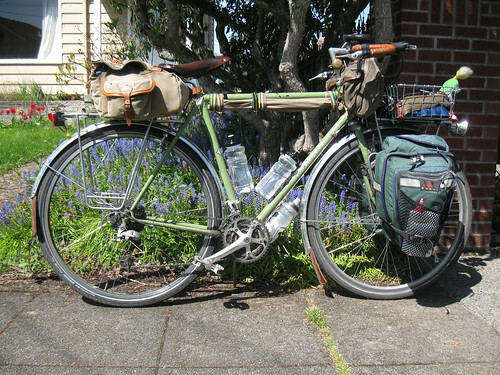 I ended up having to ride into Port Townsend to get supplies for dinner and smaller bills to pay for the site. It had become a lovely evening with tattered clouds in the blue sky. But by the time I was back to camp it had clouded up again and was rather chill. A long, tiring day, but enjoyable in the main.